Senate Majority Leader Mitch McConnell says that if President Donald Trump decides to fire Attorney General Jeff Sessions, his replacement won’t be a Senate Republican. Some of Trump’s allies have suggested he will replace Sessions, whom he has repeatedly criticized, after the midterm elections. Sen. Lindsey Graham has been the subject of speculation about the job, but Graham said this week he has no interest. He cited the Republicans’ thin, 51-49 Senate majority. McConnell wouldn’t say whether the Senate would insist that Sessions’ replacement would protect special counsel Robert Mueller’s Russia investigation. Senate Majority Leader Mitch McConnell says he’s expecting a “relatively lively” lame-duck session of Congress after next month’s midterm elections, including a possible partial government shutdown over funding for President Donald Trump’s promised border wall. House Speaker Paul Ryan has promised a “big fight” over the U.S.-Mexico border wall, and McConnell did not shy away from a partisan battle over wall spending. 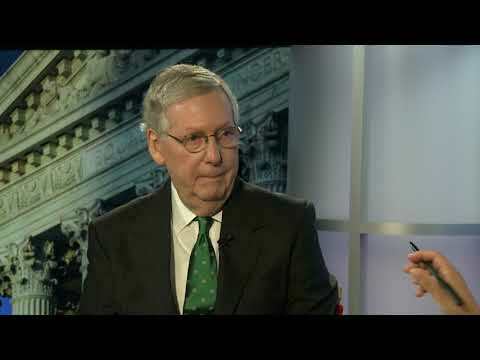 Senate Majority Leader Mitch McConnell says it’s not his job to police President Donald Trump’s Twitter habits or his divisive rhetoric at campaign rallies and elsewhere. In an interview with The Associated Press, the Kentucky Republican cited the Trump administration’s “extraordinary” success with the GOP-controlled Congress — including a growing economy, two new Supreme Court justices and congressional action to cut regulations and taxes. McConnell said he “generally” declines reporters’ requests for him to critique “on a daily basis” the president’s broadsides of political opponents and the FBI, along with Trump’s most incendiary comments about women, immigrants and other groups of Americans. Senate Majority Leader Mitch McConnell is warning Democrats to think carefully about “presidential harassment” if they win the majority of the House. The Kentucky Republican told The Associated Press in an interview Wednesday that Democratic threats to investigate President Donald Trump’s finances and businesses would “help the president get re-elected” in 2020. McConnell told The Associated Press on Wednesday the gender gap “clearly is wider than it used to be.” But he says the controversy over Kavanaugh could end up helping Republicans by generating more enthusiasm among GOP voters who feel he was mistreated. McConnell says he thinks the Kavanaugh fight contributed to Republican voters “getting more interested” in the midterm elections. Beside the gender gap, McConnell says Republicans “also had an enthusiasm gap.” He says “the controversy ironically produced an adrenaline shot” among Republicans. Senate Majority Leader Mitch McConnell has declined to blame Democratic Sen. Dianne Feinstein (FYN’-styn) for the initial public disclosure of a woman’s sexual assault accusation against Judge Brett Kavanaugh before he was confirmed to the Supreme Court. California college professor Christine Blasey (BLAH’-zee) Ford says Kavanaugh assaulted her when they were teenagers, which Kavanaugh denies. Ford had asked for confidentiality in a letter to Feinstein. Other Republican senators and President Donald Trump have suggested Feinstein’s office is responsible for leaking Ford’s story. But McConnell emphasized Wednesday in an interview with The Associated Press he hasn’t criticized Feinstein’s handling of the matter. Still, the Kentucky Republican says the disclosure was “clearly an example of others using” Ford. Feinstein has denied leaking Ford’s letter. Senate Majority Leader Mitch McConnell says “nobody’s going to beat” Republican Sen. Lisa Murkowski of Alaska despite her opposition to Brett Kavanaugh’s Supreme Court nomination. President Donald Trump has said Alaskans “will never forgive” Murkowski and that she’ll “never recover” politically. McConnell told The Associated Press in an interview Wednesday that “She’s certainly going to recover.” He pointed out that Murkowski won election as a write-in vote in 2010. “She’s about as strong as you can possibly be in Alaska. Nobody’s going to beat her,” he said. Murkowski bucked her party and voted against advancing Kavanaugh’s nomination. She voted “present” in the actual confirmation vote.